I had heard so much about this book before I finally picked up a copy. People are raving about it all over booktube, and I finally succumbed to the pressure and bought a copy. It’s safe to say I wasn’t disappointed. I loved this book so much. It was a real binge read, I just couldn’t put it down. One of the main reasons I love this book is because of the role Simon Snow plays in the novel. Simon Snow is this worlds Harry Potter. Simon Snow is a boy magician who attends a magic school. Gemma T. Leslie has written eight books following Simon Snow’s adventures ( it’s not fair that they get eight, and we only got seven) and movie adaptations have been made of the series. Simon Snow is obviously not as good as Harry Potter, but it mirrors the HP fandom in many ways. Cath, our protagonist, writes a Simon Snow fanfiction in which Simon and his nemesis Baz are a couple, which I loved. It reminded me of all the ridiculous ships in contemporary fandoms (eg. Johnlock from BBC’s Sherlock). Simon and Baz clearly hate each other in the novel, similarly to Harry and Malfoy, but Cath is convinced they are in love. I also loved that even though Wren, Cath’s twin sister, is the epitome of coolness, she remains a big Simon Snow fan to the very end. Cath and Wren grew up with Simon Snow, and it remains a huge part of their lives even as they go to college. This is a concept many of us can identify with: the connection that the girls feel to the series, the part it played in their lives, and their sadness as it ends. The characters in this book are fantastic. In my opinion they had a lot more depth to them than characters usually have in YA fiction. I found that Cath is one of the most relatable characters I have read in a long time. Even though Cath is quite introverted and shy, she’s not painted socially inept like so many quiet characters are in YA fiction. Levi and Nick, the love interests in the novel, also don’t conform to the stereotype of the YA love interest. Wren’s main characteristic may be her desire to party, but there is a lot more to her than that. The girls relationship with their mother was quite interesting and kind of upsetting, but I didn’t think it added that much to the main plot. It was interesting to see how the twins reacted differently to their mother’s actions, which were questionable at best. Regan, however, was my favourite character by far. She is just so no-nonsense, I finished the book feeling that everyone should have a friend like Regan. The complexity and non-conformity of these characters teach an important lesson. People are extremely difficult to define and put in boxes, and we shouldn’t try to. The plotline in this novel was quite unusual. I was under this impression that this would be a romance, but the storylines revolving around Cath’s family and personal development were nearly more important than her romantic endeavors. I found it quite refreshing that her relationships are not the key ingredient to her happiness like they are in so many novels, but more of a happy bonus. This book is definitely more of a coming of age story than a romance, and it was wonderful to watch Cath grow and develop in front of my eyes. Another aspect of the plot was Cath’s struggle when it came to her fiction writing course. She is clearly very talented as she gets into a Sophomore (I think) fiction writing class , and very experienced (her Simon Snow fanfiction is three times the length of a normal Simon Snow novel and she has an international following). But Cath still struggles with fiction writing and finds safety and comfort borrowing from Gemma T. Leslie. 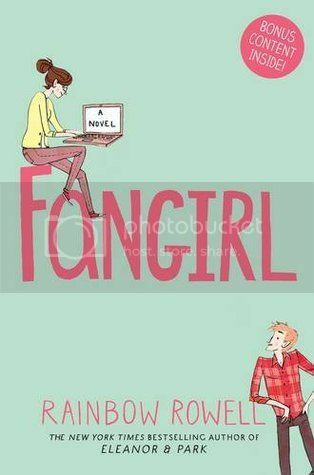 Fangirl also raises some questions with regards to the legitimacy of fanfiction, which were very interesting to think about , especially in the light of the Cassandra Clare fanfiction “scandal”. Overall I loved this book. It was quite quirky and honest, and I really related to Cath and her situation, especially as a freshman in college. I would recommend this to anyone who likes YA contemporary fiction. It’s an easy, quick and thoroughly worthwhile read.